Jay Naidoo, former General Secretary of COSATU and human rights activist, recently met with Ashok Kumar Bharti, the Chairman of India’s National Federation of Dalit Organisations. Naidoo describes India’s caste system, which discriminates against Dalits and “untouchables”, as being a “terrible form of apartheid”, adding that were he born in India he would probably be a Dalit fighting for social and political freedom. Naidoo is the author of Fighting for Justice. The founding father of the fight of against untouchability – the Mandela of this cause was Dr B.R. Ambedkar, a jurist, philosopher and social activist who sparked the fight for the rights of the Dalits and who won over Mahatma Gandhi to this cause that saw the Indian Consitution in 1950 outlaw discrimination based on caste. Swallowing the acid taste of bile and fear, the woman pushed forward into the crowd. She gripped her son’s hand tightly, aware of the irony that she was only moments from letting him go. The sounds of the fairground, reminiscent of happier times, seemed jagged and tuneless to her screaming nerves. Her eyes darted wildly as she searched for the gentle blue eyes of the old man who worked the Waltzers. Despite his faded tattoos and dirty jeans, there was a kindness that radiated from him like a soft mist onto the kids who queued for his ride. She had watched him from the shadowy corners of the fairground as the neon lights illuminated his ready, if tired, smile. She took a deep breath and crouched to look directly into her son’s troubled eyes. There was already a watchfulness around the corners, and her throat tightened at its cause and her inability to protect him. Forcing a smile, she palmed him two pounds and motioned towards the Waltzers. The boy smiled before narrowing his eyes thoughtfully. Squeezing him tight, she slipped a single piece of paper into his pocket and watched his tiny frame, dwarfed by the ride, struggle to climb into the still-rocking car. She stared as the Waltzer picked up speed and began to rotate faster and faster, throwing the boy from one side of the carriage to the other. She continued to watch him, till he became a blur of movement and colour, listening for his sudden laugh over the sound of slot machines and sirens. Hiding the sound of his whooping deep within, she finally turned away, hearing the unmistakable sound of her heart snap. She moved blindly into the crowd, soon swallowed by the darkness and the silent keening of her grief. Visit the Bad Blood Facebook page for more! Stand a chance to win a copy of Nechama Brodie‘s Inside Joburg by visiting Pan Macmillan’s Facebook Page and leaving a comment on your favourite place in Joburg, or by tweeting your favourite Joburg destination with the hashtag #InsideJoburg. Go, Go Go! 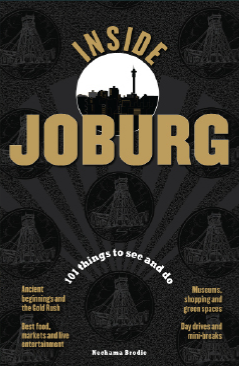 …and here are some of our own tweets about Joburg’s hot spots taken from Brodie’s book. Call it a mini #InsideJoburg Twitter guide! Win an e-reader and a hamper of ebooks with Pan Macmillan and Marie Claire! Click here for the details on how to enter – and read on for excerpts from two of the books that you can win. I am back in the dating game. After just a month. This has taken even me by surprise. I officially got lucky on Saturday – smooch lucky. With a guy called Hansel. Handsome Hansel is Austrian. It happened in a dark corner of Manhattan, a place for drunk, single people. If he’s sensible, he won’t phone me again. But it’s all right if he isn’t sensible, I feel like a little roll in the hay, actually. I miss intimacy and am sick of hugging a bottle in order to find some. However, a month on from our unofficial divorce, I have hit my first getting-over-Anthony obstacle. He’s going on a date with someone from his bloody polo club. Apparently, as Bennet claims, but I take this information with a pinch of salt, she has a moustache. So I’m not going to blow the fireworks they potentially have out of proportion. Plus she swings a polo mallet around. A moustached mallet-swinging bird. I will not panic. It does, however, feel like I’ve been impaled in the stomach with a blunt instrument. When I first heard the news, I couldn’t breathe for an hour. My colleague Dierdra had to take me to the Radium Beer Hall during lunch for a double gin and tonic. Needless to say, after another two gins, I started breathing normally again. It sorted me out because I’m reeling with resentment. I will now date with a vengeance. Guilt-free. I worried for a brief second that Anthony would feel hurt that I’m already dating, but if he’s out on the prowl then I’d better get out there too – even if I’m not quite ready. There’s no way he’s allowed to move on before I do. That is way too humiliating. Last night I went out with Austrian Hansel to prove to myself that I’m now really on the market. In The Thirtieth Candle, thirtieth birthdays loom… Skeletons come creeping out of closets… How will this birthday end? Linda has just cast off yet another lover, while Dikeledi can’t seem to pin her fast-talking lawyer down to talk about marriage. Nolwazi has a secret – one she can’t share, even with her closest friends, while Sade has found the perfect man, and a new life that will shut out the horrors of her past forever. Or will it? Linda was the first to arrive. She parked beneath the carport next to Sade’s Mini Cooper, and grabbed her cellphone to check on Nolwazi and Dikeledi. To her distress, Nolwazi’s phone was still off. It was already six thirty. Was she with her secret lover? Linda hoped not. The man sounded like pure poison. There was a lot about Nolwazi’s relationship with him that Linda did not understand, especially the fact that he was a secret in the first place. Linda was very bad at keeping secrets, but she had promised Nolwazi never to mention the man to Sade or Dikeledi. The sheer effort of it made her want to gag. She tried Dikeledi, who confirmed that she was on her way. As Linda walked up to the front door of Sade’s classy, modern cluster, the door opened before she knocked. “Hi, girl. Looking good,” said Sade, offering Linda a warm hug. As Linda made herself comfortable on one of Sade’s cream leather ottomans, she noticed that Sade had changed her curtains. In place of her old, standard white linen curtains she had fitted glorious designer curtains made with a mixture of creamy organza and toffee-brown taffeta material. The results were quite impressive. The house looked elegant from every angle. Sade had always had good taste, and now, with the new job, she seemed to have launched into a serious style offensive. “What? Are you pretending to be something you’re not?” asked Linda. It’s time to unwind. There’s nothing more satisfying than getting lost in a captivating book. Be it at the beach, beside the pool, or wrapped up at home this holiday, don’t miss out on your chance to win some spellbinding holiday reads and an eReader with Marie Claire. To stand a chance of winning one of 10 signed copies of Jay Naidoo’s Fighting for Justice, simply visit the Facebook page linked to via the image above and click the “Like” button. You’ll automatically be entered into the draw! Send no flowers. My Facebook profile is dead. A little after midnight, on Monday May 31, I permanently deleted my Facebook account. I even made a Facebook suicide playlist, starting with The Clash (Should I Stay or Should I Go) and ending with — well, it couldn’t really be anything else, could it — Sinatra’s My Way. I realised, even before I pushed the “kill” button, that my Facebook suicide would not be a particularly big deal to the site’s 26-year-old co-founder Mark Zuckerberg, with his estimated personal fortune of $4-billion. And I’m confident not too many of the nearly 500-million other Facebook users will even notice I’m gone. Although my mother has said she’ll miss me. Most of my friends acted as though I’d suggested they give up smoking. Although none of them smoke anymore, now that they have kids and houses and bonds and digital family photo albums.